From banking and transportation to healthcare and even the way we use technology in workplaces, more and more tasks are going digital. Applications are the main driving force behind these engines of change. Applications have become the focal point of businesses as a whole – ensuring product and service quality, enhancing operational efficiency and boosting profits are all dependent on an organizations ability to innovate its application estate. 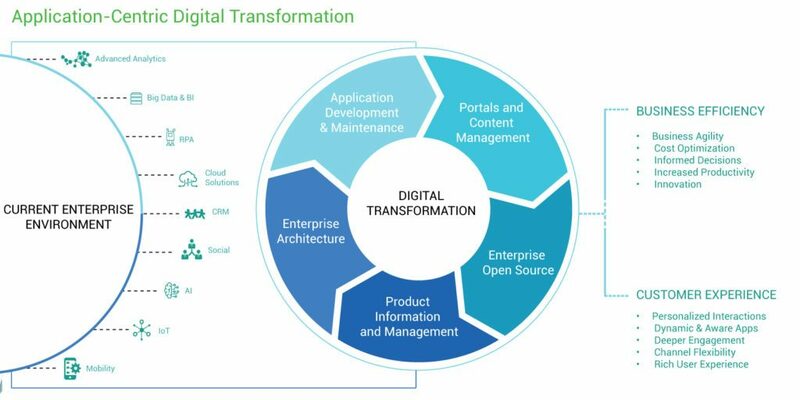 Enabling application-centric transformation has become crucial for building a digital future. Our global expert team with diverse industry experience delivers cohesive and forward thinking strategies to create customized digital enabled applications roadmaps. We help organizations define target architecture options and transform them to achieve increased agility and profitability. Happiest Minds manages critical applications for leading companies. Helping customers reduce cost with zero down time. Offer better products and services to customers with renewed focus on innovation. Improve customer satisfaction, driving retention, and revenues. Capture new markets and channels. Improve business agility and respond faster to changes. Streamline business processes to improve efficiency and reduce TCO. Gain competitive advantage by staying ahead of the curve. Through our enterprise architecture and design services, we accelerate capability development and help reduce cost, minimize risks, and maximize ROI. Enable innovation at all levels in the enterprise. Happiest Minds Portal and Content Management solutions help you streamline, optimize, and manage digital experiences through content. Effectively manage pages, workflow, and navigation. Deliver a consistent brand experience across channels. Derive actionable customer insights and optimize marketing strategy. Get efficient, direct access to content from a single repository for high productivity. Control content flow, reduce errors, and minimize efforts with automation. Consolidate data management and get risk free data storage and backup. Happiest Minds Product Information Management service enables organizations to transform legacy systems and deliver in-depth product information for millions of stock keeping units (SKUs) in industries like retail, CPG, and manufacturing. Rapidly publish and manage rich product information. Gain contextualized and personalized information across the value chain. Boost sales and marketing efforts improving customer acquisition. Improve compliance by creating a “golden record” for product data all the way through a product’s lifecycle. Drive personalized digital customer experiences with curated product content that tells compelling product stories.